Do you dream of adding an outdoor space to your home that is both beautiful and functional, where you can grill, dine, entertain, and relax? If your home’s main living area opens at ground level, you may have the option to choose from either a low-to-grade deck or a patio. Decks and patios are both great options for a new outdoor living space, as each one can be designed to be durable, long-lasting, and easy to maintain with a look that fits your style and budget. So how do you choose? 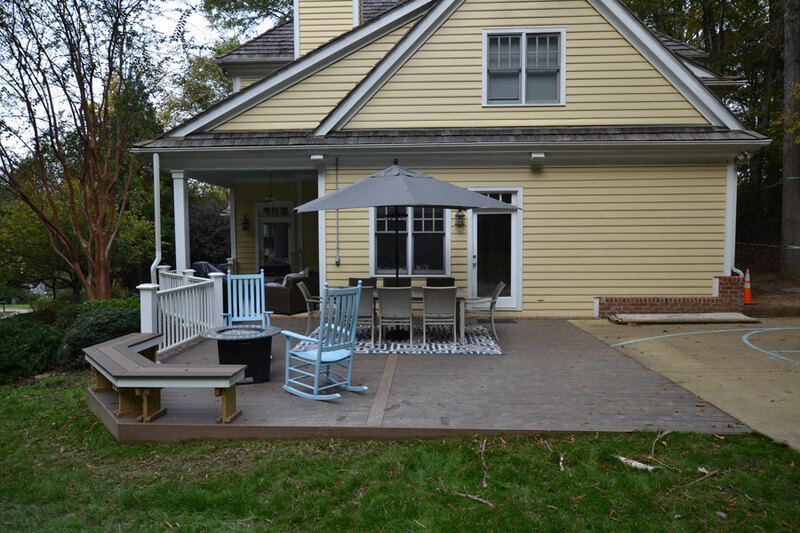 At Archadeck of Raleigh-Durham, we specialize in designing and building both decks and patios and can help you determine what will work best for you. When are low-to-grade decks a better choice than patios? One of the key factors in choosing a low-to-grade deck or patio is your landscape. If your backyard has a significant slope, rocky soil, or another type of challenging terrain, it will be easier to create a large, flat surface by building a deck. It is likely to be more cost-effective as well, by avoiding the excavation costs of creating a level area for a patio. Do you know how much of your property is covered by impervious surfaces? If your property is approaching its impervious surface limit, a deck might be necessary to comply with building codes in your municipality. A deck can be considered down to 50% impermeable, whereas a patio is most often considered 100% impermeable. Your Archadeck team can help determine these numbers for you and advise accordingly. When are patios a better choice than a low-to-grade deck? Patios are usually a better choice than decks in wet areas, such as around a pool or a hot tub, or where drainage is inadequate and constant moisture will be a factor. Patios can withstand the continuous water saturation and are often more slip resistant than decking. Some people prefer patios because they generally do not need a permit, which can simplify the construction timeline. If you choose to incorporate other items into your patio, such as a gas fire pit or an outdoor kitchen, electrical or gas work will still need to be permitted. If both are options, why choose decks? Many homeowners prefer decks to patios because they love the look and feel of wood, whether natural or synthetic. Composite decking manufacturers, such as AZEK and TimberTech, offer a large variety of colors and styles to complement a home’s exterior – allowing the new outdoor space to look original to the house. If you choose synthetic decking for your low-to-grade deck – either composite or PVC – there is never a need for staining, painting or sealing. This makes it the best choice for someone wanting a low-maintenance structure. If you choose pressure-treated pine for your deck, you will have more maintenance than is required for a patio. If both are options, why choose patios? Many people choose patios in order to blend their new structure with the surrounding landscape. Today’s patio materials have come a long way from the builder-grade concrete slab that used to be so common. You can choose from beautiful natural stone, tidy concrete pavers, or unique recycled granite pavers. No matter what patio material you select, chances are the natural look and durability are among the most critical factors in your consideration. Fire features and outdoor kitchens are highly popular additions to outdoor living spaces today. Many people choose patios for the cohesive design, increased fire safety, and attractive style provided by a stone or paver patio to host these amenities. If you can’t decide between a low-to-grade deck and a patio, the good news is you can have both! We build many combination projects. Homeowners may choose to create a more seamless transition from the indoors to the outside with a deck, and then add a patio to extend the outdoor square footage and create a second transition from the deck to the lawn. At Archadeck of Raleigh-Durham and the Greater Triangle, we help homeowners create outdoor living spaces they can enjoy for many years that fit their lifestyle, budget, and unique home site. If you are considering adding a low-to-grade deck or patio to your home, call today to schedule a design consultation: 919-973-1523. We look forward to working with you!